The tradition of offering an ‘hospo discount’ to hospitality staff members is well understood throughout the industry. However this time honoured tradition has always been little more than an unwritten rule. Hospo Club is here to change that. 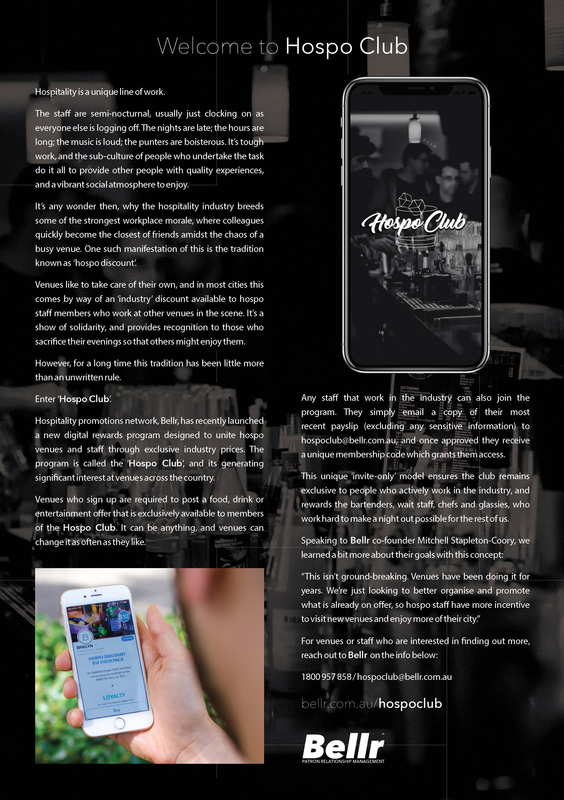 Hospo Club is an exclusive loyalty program for hospitality staff and venues, hosted on the Bellr app, which allows venues to offer industry prices to current hospitality staff members. Membership is strictly by invite-only, and you must be an active hospitality staff member to gain entry to the program. Within the app, venues can post specific food, drink and entertainment offers, which can be purchased on-demand and redeemed in your venue. Hospo Club enables you to attract more industry people to your venue, and helps to better organise and promote hospo discounts across Australia.